Click to viewThe Bigfoot press conference yielded no results and has only enraged the Bigfoot Field Research Organization. The watchdog group voiced its expert opinion on the OMFG Bigfoot situation we covered yesterday. The experts claim fraud, and the press conference did nothing to put out the fires of controversy sweeping the nation. 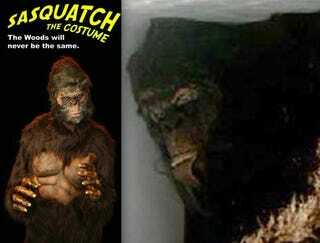 Is the cooler full of Bigfoot really just a costume? Video from the Georgians and more pictures from the press conference after the jump. UPDATE: video link to press conference is included. The men who discovered Bigfoot's remains, Matthew Whitton and Rick Dyer (from BigFootTracker.com) gathered in Palo Alto, California, baseball hats and all, for the big reveal. With them was Tom Biscardi, host of an Bigfoot Internet radio show. According to Fox News the men showed reporters two blurry photos that were the mouth of the beast and the other was a picture of the beast running around in the Georgia woods. The Scooby Gang wouldn't reveal more, to protect this endangered species. Why blurry photos, because according to the BFRO, it's really just a Halloween costume of Sasquatch and not the real deal itself. Looking at pictures of the costume, from Haunted Adventures, next to the image of the cooler is pretty convincing. The only scientist involved with them (Curt Nelson) simply received a "DNA sample" in the mail. Three results so far from that sample: 1) unknown, 2) human, and 3) possum. Nelso will do more tests, but he has said his tests don't mean anything. Biscardi said there would be no other Bigfoot news today, but promised that Fox News could bring a crew of scientist down to Georgia to examine the body. If by scientists, he means gather more drunk friends to parade around in the suit and take pictures, then I think he's right on the money. But best of all is the fact that radio show host Biscardi explained that both Whitton and Dyerbeen have received death threats throughout this whole discovery. I can only assume this is by Bigfoot's wife who is pissed that they murdered her husband and have been milking his corpse for money. Vengeance is yours, Mrs. Foot. We've been trying to bring you footage from the press conference that both CNN and Fox News were at, but my senses are telling me that now that everyone deems this an actual hoax the videos are being stripped down. Instead here is some You Tubery of The Big Foot Police talking about their discovery, it's a classic.